A Veterinary Ambulance has rushed to the aid of two swans in Eastbourne this morning. East Sussex Wildlife Rescue & Ambulance Service (WRAS) received numerous calls from motorists and members of the public as well as one from Sussex Police and Companion Care Vets. The initial reports were of a swan wandering around on the road and grass verge by the Office Outlet next to the busy Seaside / Lottbridge Drove roundabout. 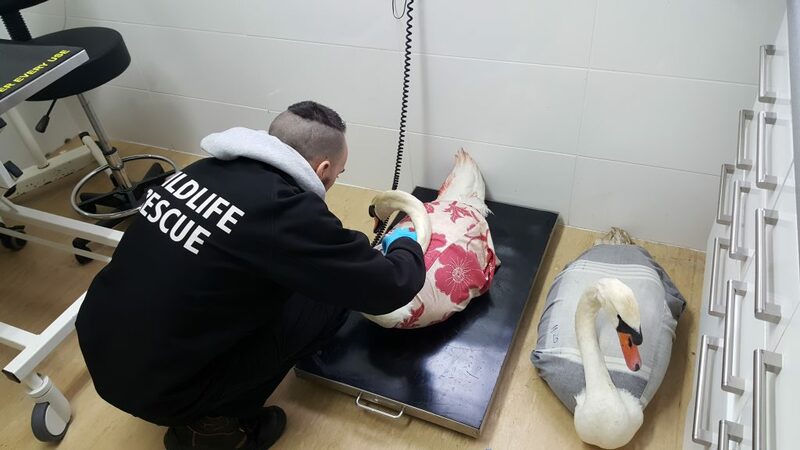 "The situation became very confusing at first when we started receiving conflicting reports as Companion Care Vets phoned saying they had picked one up and taken it had their surgery, then straight after we received another phone call from a worried lady saying she was struggling to keep another swan off the road. This was shortly followed by a call from Sussex Police. In total we received 8 calls, its so nice to see so many people caring." said Duty Rescue Co-ordinator Trevor Weeks. At WRAS's Casualty Centre at Whitesmith near Lewes, both swans were checked over by Casualty Manager Chris Riddington. "The swan collected from Companion Care Vets has an injury to one leg, but this is not too severe. After giving emergency medication was given the wound was cleaned up. However we noticed that both swans seem very settled and started forming the classic heart shape with their heads and necks as well as chatting to each other like pairs of swans will. As they appeared to be a couple they are being kept together whilst the wound on the one swan recovers which we hope will not be more than 3-5 days" said Chris. Posted in Press releases, Rescue news on April 2, 2018 by East Sussex WRAS.